Forget RPOs, “College Offenses”, and dual-threat quarterbacks. The next wave in the “cookie cutter” NFL is here and it seems pretty self-explanatory. Find guys who are really good at scoring and get them the ball. That’s it. Pretty simple, right? Not so fast. In a league that focuses so much on predetermined concepts of what a player should look like, teams miss out all the time on hyper-talented prospects. Take Chicago’s Tarik Cohen. The 5’6 181 lb “running back” is one of the smallest players in the league. “Sure he’s fast, but there’s no way he could be an every down back.”. 4.5 yards per carry would beg to differ. As would 71 receptions (team leader) for 725 yards and 5 touchdowns. Chicago found a guy in the fourth round of the draft, that had been passed on by every team, who is really good at getting into the endzone. Get him the ball. Watch him score. This may seem like a new age concept, but one team has been doing it for 15+ years. It’s no mistake that this particular team has 5 Super Bowls in that time span. The New England Patriots have been “out personelling” opponents with “lesser” talent for years. Ok, Tom Brady helps, but the cast that Belichick and OC Josh McDaniels have surrounded him with has been a huge part of their sustained success. Their offense is constantly morphing around the personnel. From a pure West Coast offense with Deion Branch and Corey Dillon, to a 4-Wide Spread with Wes Welker and Randy Moss, to an “Air Coryell” concept with the best pair of tight ends in the league with Gronk and Aaron Hernandez. The most recent edition features an awesome combination of all of these concepts. Almost a “McDaniels/Brady Greatest Hits” if you will. It makes sense. Brady has been doing this so long, at such a high level, that there’s nothing he hasn’t seen before. McDaniels has no limitations on what he can call (except maybe quarterback throw-backs). This year’s offense seamlessly moves from power sets to spread attacks at a moment’s notice. The other prevalent trend flowing through NFL offenses now is to get to the LOS as fast as possible with a preset play, let the OC see the defense and adjust accordingly by communicating into the quaterback’s earpiece in his helmet. Current NFL rules allow that earpiece to be active up until 15 seconds are left on the play clock. So by getting to the line immediately, play callers have upwards of 15 seconds to communicate with their quarterbacks, essentially taking a majority of the pre-snap pressure off of the QB. The quarterback that will be facing off against Brady in the Super Bowl, Jared Goff, utilizes this tactic to great effect. Brady, however, comes to the line with two plays and checks into the one he feels will have the most success. He also has the ability to check outside of the pre-called plays into other options. I was recently having a conversation with a co-worker at the office who shall remain unnamed. This heretic had to the gall to call Brady “overrated” because he only throws “short passes”. I calmly and maturely informed him that everything Brady did before throwing these so-called “short passes” is what makes him great. The genius of the McDaniels/Brady combination was on full display in the AFC Championship in Kansas City. Facing an overwhelming Chiefs offense, the Patriots went full 2004 by going back to a two back west coast offense. Sure, New England based out of 11 personnel (1 RB, 1 TE, 3 WR) like every other team in the NFL, but a majority of the snaps in that grouping came in the 4th quarter and OT when they had to move the ball quickly. The true genius came in the first three quarters, where the Patriots spent a ton of time in two-back power sets, 21 personnel (2 RB, 1 TE, 2 WR) and 22 personnel (2 RB, 2 TE, 1 WR), with the obvious emphasis on clock management. Of their 93 snaps, 42 came out of 21 or 22 groupings. For comparison, the other three teams playing Championship weekend combined for 15 such plays. 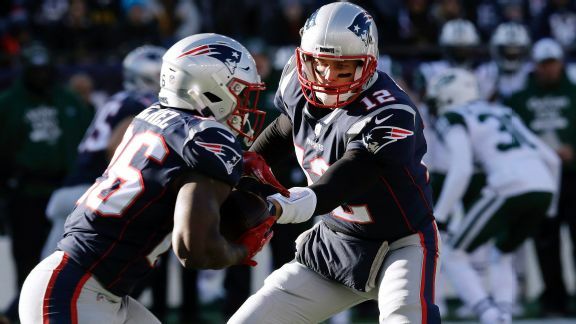 A huge factor in the Patriots’ ability to move back into these formations has been the emergence of Sony Michel. Michel has surpassed 100 yards on the ground in back-to-back playoff games, averaging 4.57 ypc along the way. He also set the rookie record for playoff rushing touchdowns with 5. Michel is the perfect compliment to his backfield mates, James White and Rex Burkhead. It means that we’re seeing the final form of Tom Brady, and it’s terrifyingly beautiful. There’s no defense he hasn’t seen, no pressure that he hasn’t felt, and no situation he hasn’t overcome. The Rams are preparing to face super saiyan Tom Brady with one of the deepest group of weapons he has had.